LED Light promotes a natural reaction in the skin, which triggers the body to change light energy to healing energy. This healing energy helps the body to repair the skin naturally. Plants all over the world use the same process turning sunlight into energy so they can grow and repair themselves! Using nature to heal and repair our skin. The treatment is clinically proven to be safe for all skin types colours and conditions. 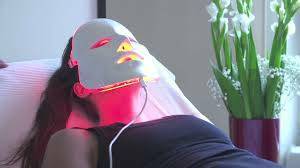 The treatment uses different coloured lights to penetrate the skin’s surface at varying depths. This stimulates blood flow and boosts the body’s natural production of collagen, that helps to delay the ageing process. Increased collagen production improves the suppleness of the skin. In addition to its tone and colour, whilst helping to reduce the appearance of unwanted lines. The sessions last between 20-30 minutes each. This treatment is ideal for those who suffer from sensitive skin conditions such as acne rosacea, eczema, and psoriasis. Or want to reduce the signs of old age! The red light has an anti-inflammatory effect on the skin, whilst stimulating the body’s natural production of collagen. This reduces the redness associated with various skin conditions and improves the elasticity of the skin reducing lines and wrinkles. The blue light treatment has a powerful cleaning property that helps to clean and purify problem skin. Whilst helping to control oil production. This treatment reduces the redness of the skin. The treatments cleaning properties help the body to naturally kill unwanted germs in the skin. Reducing the appearance of acne rosacea and preventing breakouts. In addition, the treatment shrinks enlarged pores making it harder for bacteria to collect. This, in turn, helps to prevent infection and is an ideal alternative to medication and their side effects.